Join The Great SKYCITY Easter Egg Hunt this April and go in the draw to win one of five ultimate family prize packs valued at $2,000 each. Each package includes two nights accommodation plus breakfast in a Premium Suite for two adults and two children at SKYCITY Hotel, a $1,000 SKYCITY Gift Card, a family pas up the Sky Tower with a Magic memories photo pack to take home, plus valet parking during your stay. Simply pick up an entry form from the SKYCITY Atrium and go on the hunt for the giant Easter eggs located around SKYCITY for your chance to win. Four eggs have a letter or symbol, write them on your entry form to complete the special phrase and drop your form in the draw box in the Atrium. PLus, there's a special fifth golden egg hidden somewhere. Find it, write it's location on the entry form and you'll get an extra entry in to the draw. 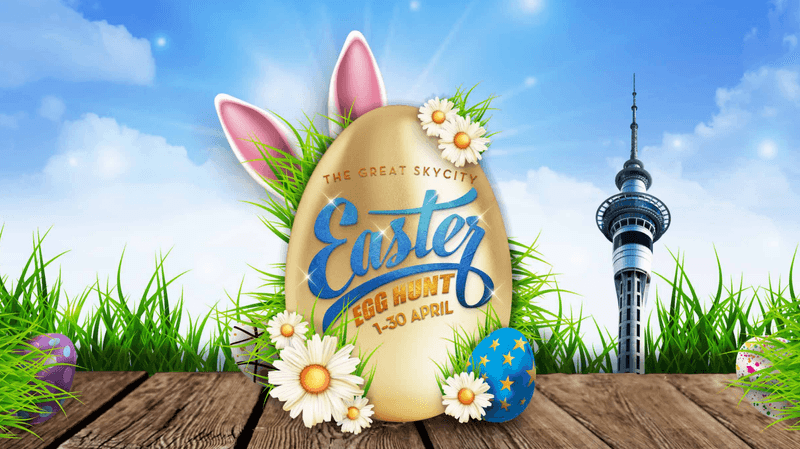 The Great SKYCITY Easter Egg promotion runs from 9am on 1 April 2019 to midnight on 30 April 2019. Limit one entry per visitor. Five winners will be drawn at 10am on Thursday 2 may 2019 and notified using the contact details on the entry form. Each winner must claim their prize within 24 hours of being notified or another winner will be drawn. SKYCITY employees are not eligible to enter. For full terms and conditions please visit the website.